I have been waiting for this day for a long time now. I met Tommy Dahlgren, along with his wife Bente and their son Anders in 2008 at the World Short Mat Championships in Herentals Belgium. 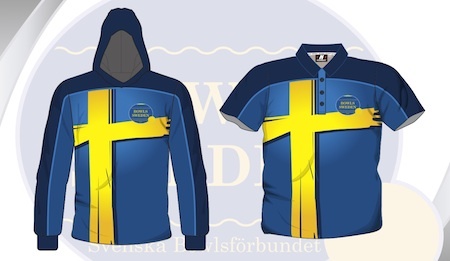 I am glad to say we have stayed in contact ever since and I proudly display the Swedish Bowls jersey that they presented to me at that Championship in my home today. Tommy is in charge of the Swedish Bowls Federation and has done an amazing job in Scandinavia promoting the game. Right from the beginning I was really impressed with what they had accomplished in a short time in Sweden. Great uniforms, young people and a positive winning attitude about the game of Bowls. 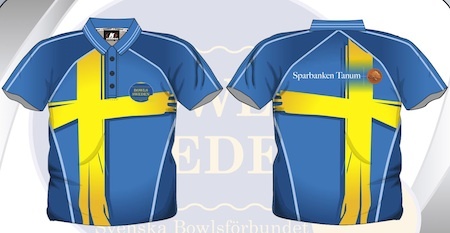 For those who know me, I have always talked about the Swedish Bowls Federation and my hopes that one day they would join the International scene. As we all know, once Sweden came on board, so would Norway, Finland and hopefully Denmark. Having only short mat facilities in Sweden they were unable to make that final leap to World Bowls. I am proud to say with a lot of hard work, vision and goals, that time has finally come to take one more giant step to making this happen. In a couple of days on June 9th 2012 the first outdoor green will open in Scandinavia. It will consist of 5 rinks, 36 meters long and 5 meters wide. It will be located in Norway at one of the biggest leisure and sports complex in the town of Skien in Telemark. It will be an artificial surface to start with, with plans to further expand. “I was there yesterday when we painted the lines in the Norwegian colours of red/blue and white. The surface maybe not perfect but this will be a smart, colourful way to play bowls. But we have done it so we can also play competitions. The name for this game will be Family Bowls with easy rules to follow for a game, but we will also do international rules when we have proper games. They have also plans to set up carpets 30 meters for use indoor wintertime just to roll out. I think that Norway very soon will ask for membership in EBU and World Bowls. This is just the beginning of the beginning. We are also working hard to open the first outdoor green in Sweden, hopefully later this summer (Aug) also on artificial grass. And Next summer a green 40×40 meters on grass in the south sunny part”. All I can say is great job Tommy and Team, I congratulate you all on this hard work and I am glad to say I have witnessed this first hand. I knew you would accomplish this, it was just a matter of time. This is a perfect example of that if you want it bad enough, you can make it happen. Talk is cheap and if you love the game, then get out there and promote it, speak about and just do it. As only we as players can share our love and passion for the game. You are definitely a visionary for the game of bowls and we are proud to have you representing and expanding the sport.